The Gospel this past Sunday, the feast of Christ the King, was Matthew 25. 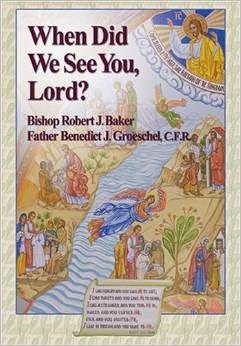 The genesis of this book was inspired by a set of talks that Father Benedict J. Groeschel C.F.R., gave several years ago in the Diocese of Manchester, NH. At the time while researching material for a project I was working on I came across an advertisement for the talks and found both the title and topic striking. The topic seemed to fit Father Benedict's lifetime of working among the poor and raising money to help their plight. I approached him, shortly after listening to the tapes and asked him to consider doing a book version. He liked the idea but was reluctant to pursue the project alone due to the shortage of time available to work on it. Unwilling to let go of the project, I approached another friend of the poor, Bishop Robert J. Baker of the Diocese of Charleston. I knew that Bishop Baker's priestly ministry had been devoted to finding Christ in the poor and with a wealth of experience he had in this area that if I could join his thoughts with Fr. Groeschel' s we would have a book that would be of great benefit to the rest of us. After approaching Bishop Baker with my request he agreed and then Father Benedict agreed to collaborate on this book. While the Bishop and Father Benedict were working on the written text of the book I came across a stunning work of iconography one day while visiting an Eastern Catholic church. On the back wall of the church was an icon of the Last Judgment taken from Matthew 25. I found that the great iconographer Mila Mina had written the icon. I immediately contacted Mila and asked if the icon might be used as an illustration for this book, her response was "anything to make the Gospel known!" Thanks to Mila and her son Father John Mina for allowing Joyce Duriga and David Renz to photograph the icon at Ascension of Our Lord Byzantine Catholic Church, Clairton, PA.
Fr. Groeschel has written the introductory text that begins each section as well as the final "What Should I Do?" at the end of the book, and Bishop Baker has written the individual meditations and prayers contained in each of the six sections. While this book was being written, Father Benedict was involved in a horrific accident that nearly took his life. At the time of the accident the text he was working on was in his suitcase. He had just finished the introduction to "When I was a stranger..." as you read over the text for that section you might sense that he was having a premonition of what was about to happen in his life-where he would soon be in an emergency room under the care of doctors, nurses and as well as his family and religious community. You will find that this book provides you with keys to finding Our Lord in the poor, and to overcoming the fears and obstacles (represented by the seven deadly sins in each section) that prevent you from responding to His call.